Since moving from the fresh air and rolling hills of Herefordshire to the bustling concrete jungle that is London, it’s not just my wardrobe that I’ve had to update, but my skincare too. I have begrudgingly become the bearer of dull, dry skin and lines lacing my eye-corners and forehead (I’m 21 – this is NOT okay). For many of us, the draw of the big city is irresistible – the jobs, the lifestyle, and most importantly, the shops on your doorstep; the joys of urban living are undeniable, however our skin certainly isn’t thanking us for ditching the countryside. It’s not just the pollution either; scientists confirm that city dwellers find it harder to ‘shut off’, and therefore stress levels are higher, but also the food that we eat and our sleeping patterns all take their toll. When I wake up in the morning to find I’m having a ‘bad skin day’, it impacts my mood for the rest of the day, and that bacteria ridden commute only makes it worse. While we can not avoid the hot, cramped tube journey, we can control our skin. So if you too are a city settler then panic not; I’ve found a few products which can help you achieve that flawless countryside skin. Taking in a lung full of fresh air as I get off the train at Gloucester always acts as a reminder of the toxic smoggy air I breathe in back in London. The traffic pollution particles irritate our skin and clog up our pores, speeding up skin ageing and the development of dark spots. As we age, this diminishes our skin’s ability to fight wrinkles and gives our face a lacklustre dullness, so my first beauty recommendation is a moisturiser to combat this. For a while now I’ve been on the lookout for an energy boosting moisturiser that can refresh my dull skin, but which will hydrate my skin all day without my makeup sliding off by lunchtime. 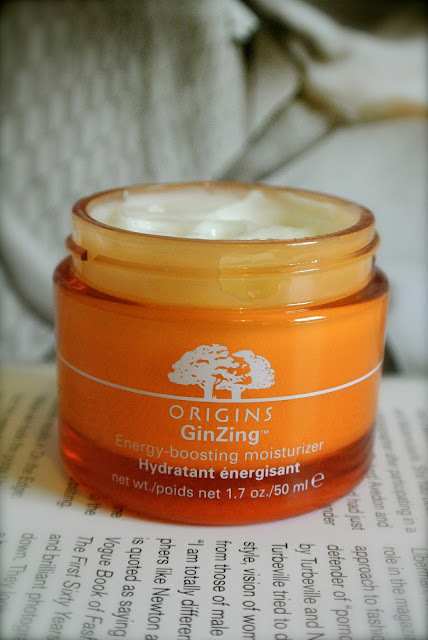 In short, Origins GinZing moisturiser is THE ONE. It is like a lightweight, oil free energy drink for your skin and is packed with skin boosters such as Panax Ginseng and coffee beans to kick start hydration levels. Upon opening the lid, close your eyes and take a deep breathe and the summery fragrance will transport you to a beach front spa, the waves lapping in the distance… AHEM. Back to London. After cleansing, toning and applying my serum, I apply the moisturiser and my skin feels incredibly nourished but without any of that oily feeling left my so many products, and the ginseng and coffee beans add a subtle glow – perfect for those grey mornings!! So for these dark drizzly mornings, the promise of this summery scent and light diffusing minerals will help to drag me out of bed, and keep my makeup look perkier through to the evening, while the vitamin B fortifies skin against environmental damage. I’m sold. When the lady at the Clinique counter asks me about my skincare concerns, I tell her that my skin is dull and dry when I apply makeup, but my lunch time I’m looking a bit oily, and need to re-apply my makeup. I’ve never really stressed about my pores, but of course I’d love them to be a little less visible for the rare day when I do leave the house without makeup! Environmental pollution is to blame for clogging pores, giving us city girls larger-looking pores than our countryside companions. 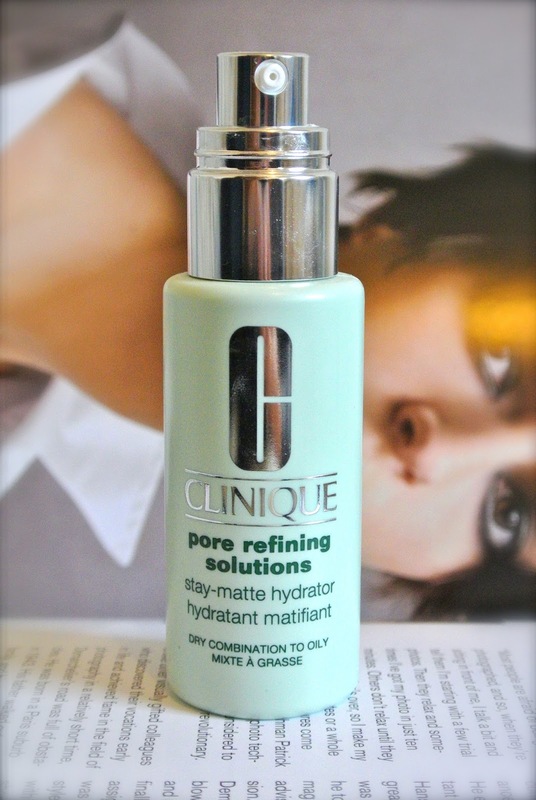 The Pore Refining Solution hydrator is one of a few products in the range, and the one that the Clinique lady recommends is best for me as it’s non acnegenic formula curbs excess oil and shine all day long. It uses light-scattering pigments to immediately reduce the look of pores and gives the face a matte look without drying skin out. I’m promised that over time, my pores will look smaller, but I’m yet to notice any difference! Upon doing further research on this product, I’ve found that it is tested on animals. I don’t know to what extent, but this is something I’m totally against, so having given the lowdown on the products’ claims, I won’t be repurchasing. It promises to reduce circles and puffs; it is a lightweight formula which supposedly holds your eye makeup in place. The pros are that it is cooling and refreshing to apply and I think this sensation tightens the skin under my eyes, helping to reduce the appearance of eye bags in the short run, however again I’m yet to really notice any long term benefits. I’m happy to use this product as a freebie from a gift set, but as I’m yet to notice any major improvements to my under-eye area, I won’t be forking out for the product on its own. Ok, I have a confession. Those of you who know me well will know that I’m a sucker for clever marketing ploys, and while I was browsing for a replacement for my naughty face wipes, I hadn’t even considered Clarins. 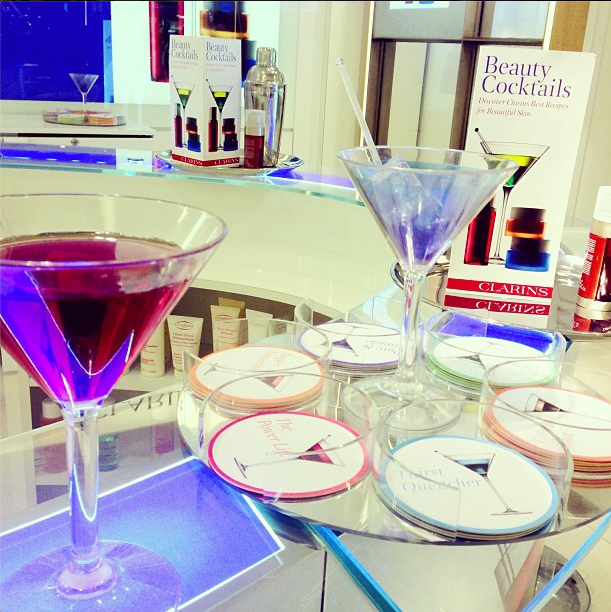 That is until I saw that they were serving Beauty Cocktails as part of the John Lewis beauty event! So I sat down and was treated to a Cranberry and Raspberry cocktail while the lovely Florence discussed my skincare concerns and carefully selected some products. She audibly gasped when I told her that I use face wipes to remove my makeup. Although so convenient, and I can do it while in bed watching The O.C, they are packed with chemicals and only remove impurities from the skin’s surface, and won’t cleanse deeper layers. 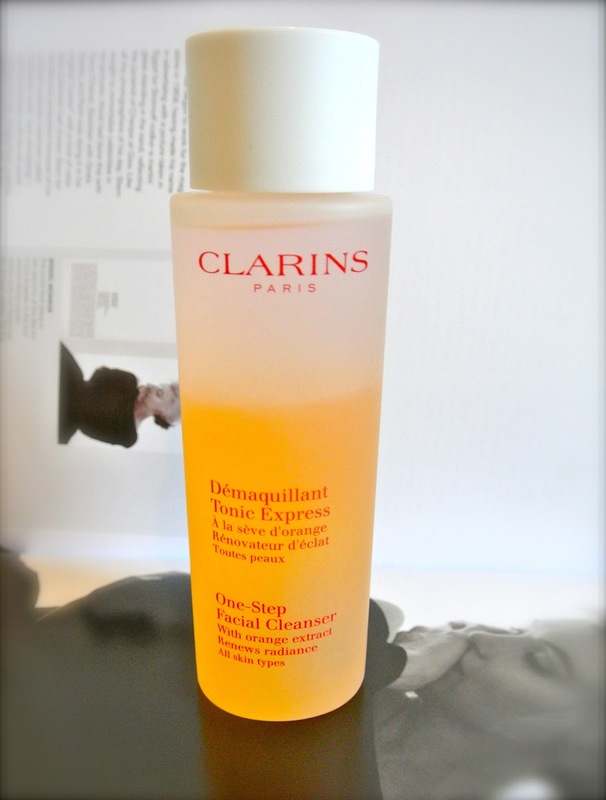 I admitted to being super lazy when it comes to removing makeup, and you wouldn’t be able to persuade me to wash my face with water etc, so I was amazed when she told me that with the Demaquillant Tonic Express you simply need to shake the bottle, apply it to a cotton pad and (this is the exciting bit) then the side which you applied the solution to is your cleanser, and the liquid separates and the underside of your cotton pad will be soaked with toner! One solution, one cotton pad, two steps! And no water! I’m pretty amazed, no more face wipes for me! Sold to the lady in pink! So I fell for the clever marketing, but I’m so glad I did. I’ve used it several times now, and actually get excited to use it. It’s not just the super fresh orangey fragrance, but it leaves my face looking radiant and completely make-up free. If you wear lots of eye makeup, you may need to soak another cotton pad in eye makeup remover. Will I be repurchasing? As long as the excitement of the double sided cotton pad effect doesn’t wear out (it won’t) then yes! 13 million of us live in hard water areas, including big cities such as Bristol and London, and the high leves of magnesium and iron make soap harder to dissolve, so it can clog our pores and leave a film on our skin. While a fantastic cleanser will help, a water softening device on taps can really help, this is something I’m currently looking into. So while I won’t be giving up city life for the simple life in the countryside just yet, (can you get cupcakes delivered to your door at 3am in the countryside? Thought not.) I think I’ve found a way to alter my skincare to reduce the effect that city living will take on my skin, and keep my skin looking as fresh as my Herefordshire home girls.